An image scanned from a photograph of the Donnaganah Hotel in Orono, Maine. 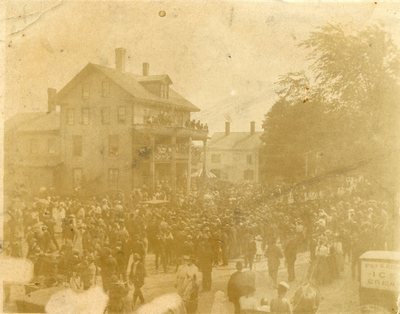 As noted by A. Douglas Glanville in Old Orono Oddments, the hotel, sometimes also spelled Donagannah or Donnagannah, was built and operated for a time in the 1850s by P. T. Whitney and was located on the east side of Main Street (p.23). It was one of several buildings pictured in the margins in the 1855 map by D. S. Osborn, where the owner is identified as P. D. Whitney. The building later burned down. A large crowd has gathered in the street and on the balconies of the hotel, and a cart appears in the foreground advertising ice cream.